And the recipe just sorta morphed into something fast and easy. And I'd really like some cooler weather with some rain. 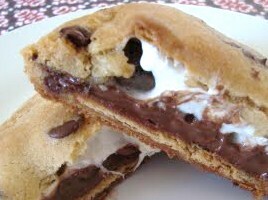 So without further ado, may I present the recipe for Slutty S'mores! 2. Spray a cookie sheet with Pam. 4. Bake 11-13 minutes until your cookie is done. 5. Plate and enjoy while warm! Add a scoop of vanilla ice cream and drizzle with chocolate syrup. That is just wrong... So I know it has to taste phenomenal! Oh my! Makes me want to turn on the oven in the kitchen to match the oven Mother Nature has got going on. I am trying these on the first day under 90 degrees. Thanks Toni!